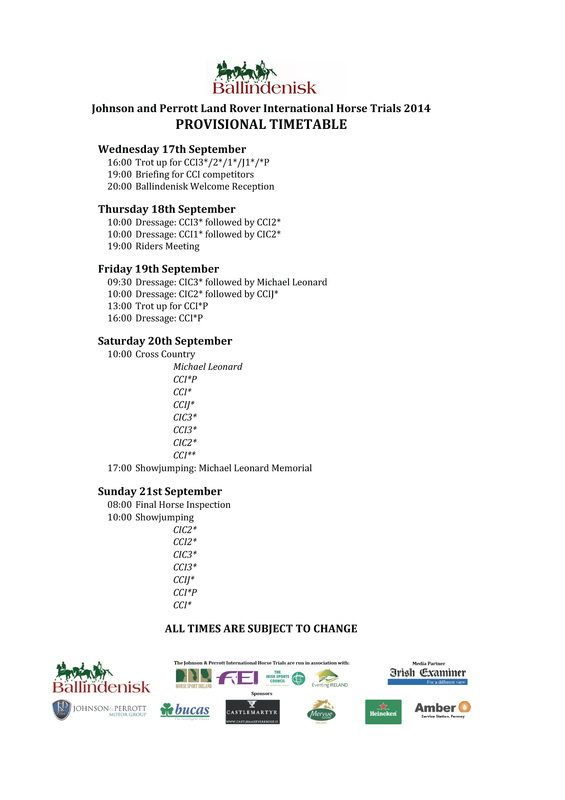 Dressage Times for all classes are now published on the Eventing Ireland website. Final preparations are underway at Ballindenisk, Watergrasshill, Co. Cork ahead of the 2014 Johnson and Perrott Land Rover International Horse Trials which take place from 18th – 21st September. Over 150 horses and riders will make their way to the Co. Cork venue which held its first equestrian event nearly ninety years ago. The Fell Family will welcome competitors from Europe, the USA and Australia to participate in the three disciplines that make up the sport of eventing; Dressage, Cross Country and Show-Jumping. The competition gets underway at Ballindenisk with the dressage phase on Thursday 18th and Friday 19th from 10am. The real adrenaline stuff starts on Saturday morning from 10am as the Cross Country phase will require horse and riders to negotiate a course of obstacles including banks, ditches, hedges and water fences across 250 acres of undulating farmland. The final phase of the competitions take place on Sunday when the speed, accuracy and agility of competitors will be put to the test in the Show-Jumping phase. There will be trade stands, great food each day and on Sunday there will be a dog show and free kids fun area. Fresh from securing Ireland’s team position at the 2016 Olympic Games, three members of the World Equestrian Games squad head a strong Irish contingent at Ballindenisk. 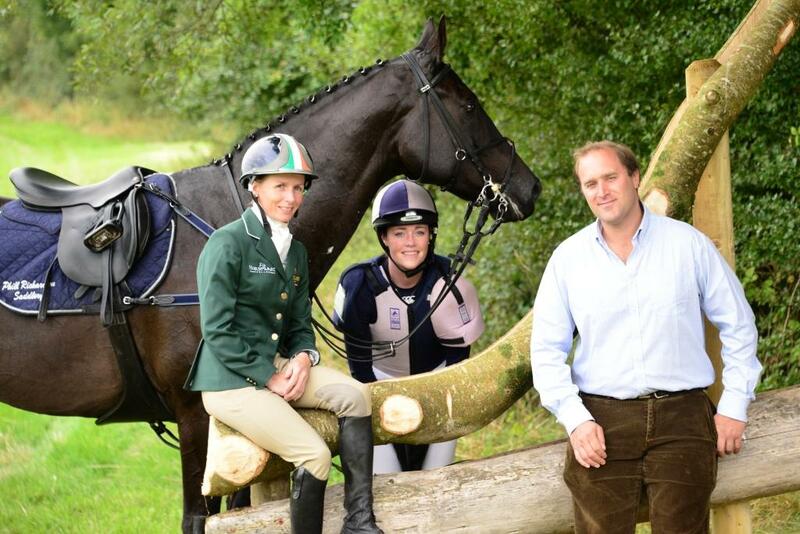 Aoife Clarke, Joseph Murphy and Sam Watson will receive a warm welcome home to compete in their first home international since their performances at the World Equestrian Games in Normandy. They will face stiff opposition from visiting competitors including regular Ballindenisk victor, Great Britain’s Oliver Townend who will be hoping to dominate the Mervue Equine Ireland CIC3* class; one of two competitions he won last year. Having helped to secure a British victory at the Ballindenisk stage of the FEI Nations Cup in the spring, Izzy Taylor is on form at the moment while Italy’s Vittoria Pannizon and Giovanni Ugolotti are also likely to feature strongly. In the Junior classes, Great Britain’s former Pony Gold Medallist Yasmin Ingham will partner Mary King’s former ride ‘Imperial Cavalier;’ a horse that brought her Olympic Silver, European Bronze and World Gold during his seven year career. The Irish Junior eventing team recently secured European Team Gold and squad members Cathal Daniels, Susie Berry, Nessa Briody and Lucy Latta are all ones to watch in the Bucas CCIJ1* class during the week at Ballindenisk. Ballindenisk is proud to provide a platform for the stars of the future to compete and as well as supporting younger riders, many of the top young horses from Ireland and the UK will feature in the Heineken CCI1*, Castlemartyr Resort CIC2* and Amber Service Station Fermoy CCI2* classes. Running alongside the International competitions, the Michael Leonard Memorial Championships for 5 and 6 year old horses will also provide a glimpse into future Olympic stars.